Book Of The Month: November 2015. Aeric Gaines and his roommate Tyler Nordgren survive the devastation of the war, only to find that the quaint, politically correct world where they’d been raised was a lie. All humans have basic needs such as food, water and shelter…and we haven’t forgotten how to fight for what we desire. A Path of Ashes is the first book in an exciting new series about life in post-apocalyptic America, a nation devoid of leadership, electricity and human rights. The world as we know it may have burned, but humanity found a way to survive and this is their story. Amazon Review By DystopianDoll Sept 6th, 2015. "From start to finish this book was a page turning masterpiece. I highly recommend this book. Another fast paced, fear inducing, realistic read from Parker. Read all of his work. You will not be disappointed." Amazon Review By WJ LUNDY May 30, 2015. "With A Path of Ashes, Brian Parker has taken a major step toward becoming a leader in Post-Apocalyptic fiction. 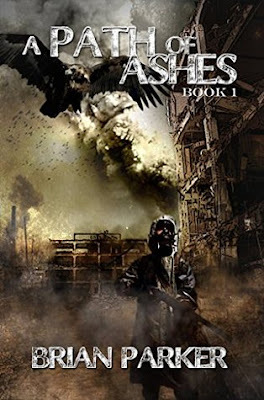 Written in the flavor of Swan Song and Earth Abides, Brian Parker's A Path of Ashes has everything a Post–Apocalyptic reader needs. Dropped into a dark world blown up by a nightmare scenario then tossed full of a fabulous cast of characters, A Path of Ashes will not let you down."